What is it about me? I have this crazy infatuation with espresso machines and obviously espresso..
Maybe it’s because I stopped drinking 14 years ago and I stopped smoking 24 years ago that I have clung so dearly to my beloved espresso. It’s my remaining vice that I refuse to give up and refuse to admit I have a probleo. I know I am addicted but it’s not that bad. It’s only a little coffee. Most of the time it’s less than an ounce of coffee. That couldn’t hurt anyone. Yeah, Yeah, Yeah. Enough said. 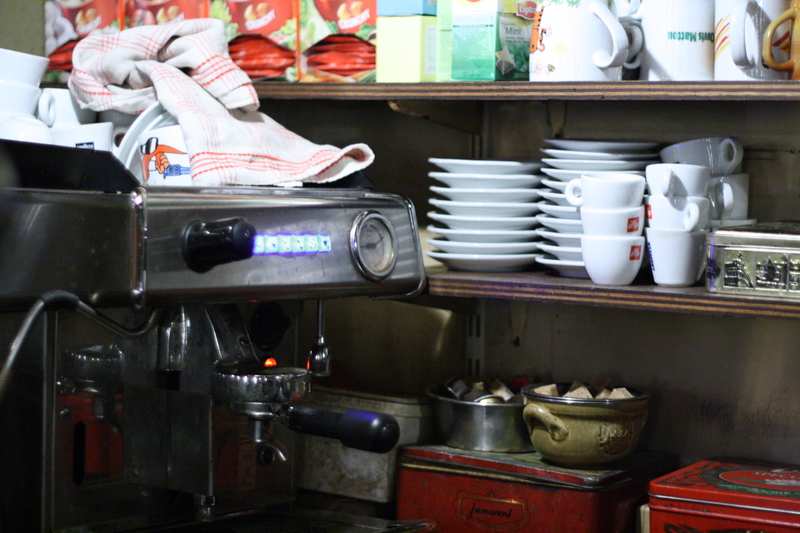 When I was in Italy and Brussels a couple of weeks ago I took a ton of pictures of espresso machines. This one was in an old artist bar. The place reminded me a bit of North Beach in San Fransisco. No one was drinking espresso. Everyone had their hands wrapped around glasses of Belgium beers. The machine is very old and so is the stuff around the machine. Check out the two metal boxes on the bottom shelf. They look ancient to me. You would never see something like that in a bar in American. Someone would throw it out and replace it with a small plastic box from the Container Store. I was amazed by the cigarette smoking in Brussels. In this bar just about everyone was smoking cigarettes and most were rolling their own. They had neat little packages of rolling papers with tins of tobacco. I have to admit it looked kinda cool. I did not smoke a cigarette. I was tempted but only a bit. I did not even have an espresso. I thought I would wait til after supper. Looking for a legal quick pick me up? Try eating some kale. That may sound a bit funny as if eating kale can somehow make you feel better. My family laughs at me because I believe this to be so. It’s true for me. Almost as good as espresso, but not quite. 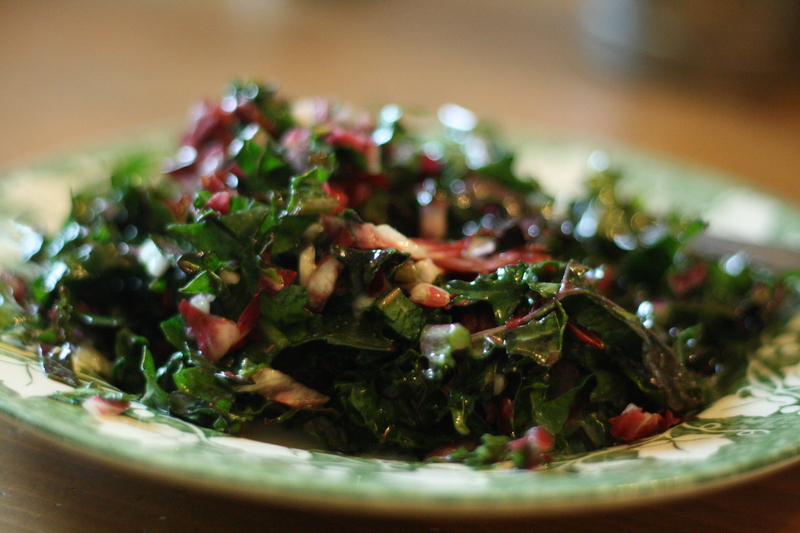 Today I made a very simple salad of Russian kale and raddicchio. I bought the kale at the Pasadena farmer’s market. Russian kale is a bit different than the kale you find in your local supermarket. It’s greenish/purple and has a broad flat deckle-edged leaf (I looked this up on Google because I couldn’t figure out a way to describe it). Kale is rich in antioxidants and is high in beta carotene, vitamin K, vitamin C, lutein, zeaxanthin, and somewhat rich in calcium. It also contains sulforaphane which is believed to be beneficial for fighting cancer. Most recipes require kale to be steamed or boiled for anywhere from 8 to 20 minutes. The longer it cooks the softer it gets. I prefer it blanched for 5-7 minutes because it retains it’s freshness and vibrant green color. For this salad I sliced it very thin like you might cut cabbage for cole slaw. I also cut a half of a head of raddicchio in the same manner. I then washed them thoroughly in a big bowl of cold water and then dried the kale and raddicchio in a dish towel. I made a vinaigrette with Dijon mustard, apple cider vinegar, a little maple syrup and olive oil. I seasoned it with salt and pepper. I then tossed the kale and raddicchio in the dressing and let it sit for about an hour so that the kale would wilt a little. Since the kale is raw it is very tough and the vinegar and salt help to break it down. I chilled it in the refrigerator and VOILA. If I am feeling a little sluggish or am starting to get a cold I make myself some steamed kale with olive oil and lemon and it helps to keep the cold at bay. My friends Stefano and Mauro eat at Anselma’s everyday. They arrive about noon and grab a table in the small but comfortable dining room. If it’s cold a fire is burning and Anselma’s husband or one of the guys is cooking something in the fire. One of the days I was there thick slices of pancetta on metal skewers were cooking away. This was our appetizer. We pull it off the skewers and eat it by the fire. Anselma’s kitchen is disorganized. She has a big metal table in the middle of the kitchen. 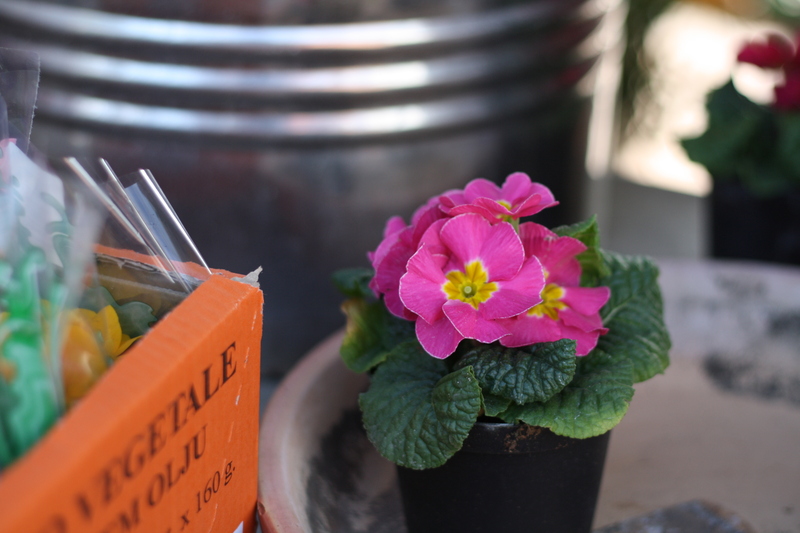 It is littered with kitchen utensils, fresh vegetables and some packaged items. She has a couple of big pots on the stove. 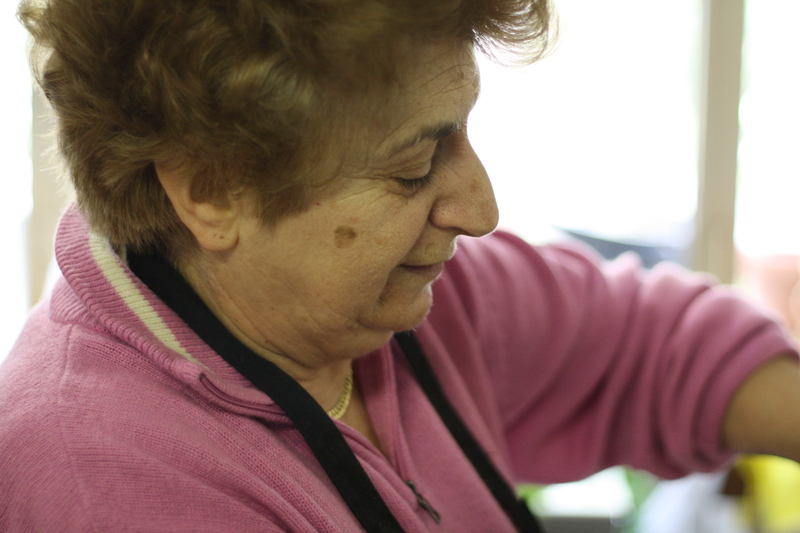 In one she is making a tomato sauce for the coda that has been braising for hours. The sauce looks familiar. It consists of onions, garlic, celery, carrots and her homemade jarred tomatoes. It may look like something I might cook, but it sure tastes better. Must be those fresh tomatoes that her husband picked from the garden last August. Stefano, Mauro and I love the coda. Stefano gives me some crap about leaving meat on the bone. His looks like something you might see in a museum. That day we also eat braised artichokes that melt in my mouth. They are pale green and soft and drenched in broth. Another day we have homemade fettuccine with porcini mushrooms. This dish is perfect. The pasta is light and fluffy and the porcini are earthy and the dish is seasoned well. I can’t believe it. It may be one of the best pasta dishes I have ever eaten. Another day cheese tortellini in crystal clear broth with nothing else. Again, the pasta is incredible. I took a ton of pictures in Anselma’s kitchen. This is Anselma in all her glory working away at the stove. 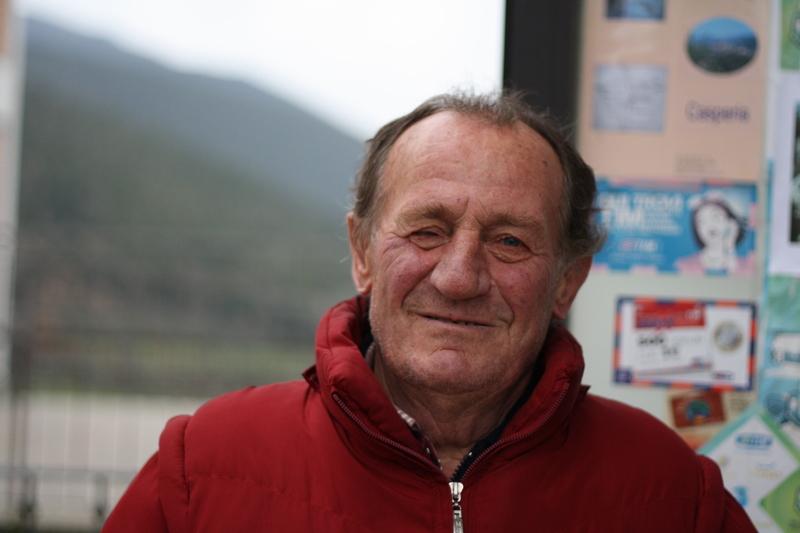 I was in Poggio Mirteto having my clothes washed at a local cleaners. I finally found a cleaners that actually has a dryer and can have clothes cleaned and dried within a few hours. Normally I have to hang my clothes for up to 48 hours depending on the weather. I am not sure if it was before or after the chocolate and crema gelato that I took this photo, but is was on the main street lined big yellow street lights. 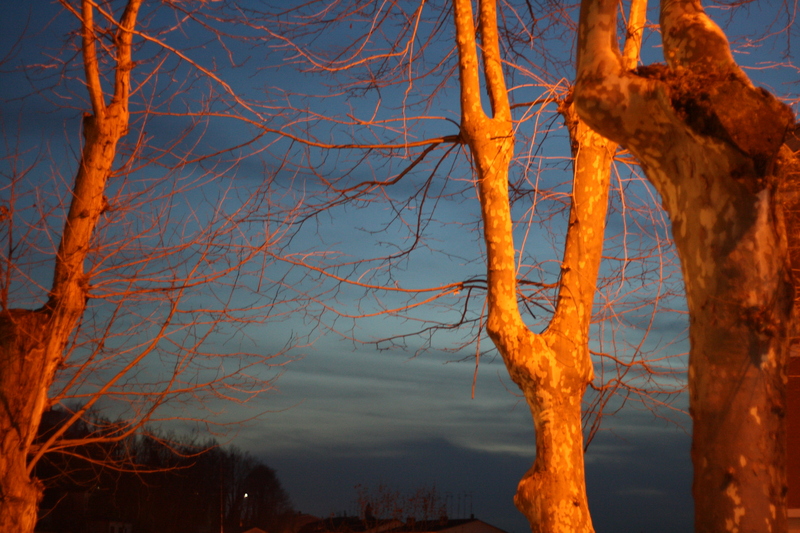 The light was behind me when I took this and it lit up the trees as if they were on fire. I really like the effect. Why is it that colors are more vibrant in Italy. Is it just me? Am I wearing some type of funny glasses that give me a rose colored view of everything. Or am I just happy in Italy and therefore everything looks brighter? I don’t know the answers to these questions. Or maybe I am just a damn fool who fell in love with Italy and now I am partial to everything Italian. My wife and kids would tell you that this is just the case. Maybe so. I love the vibrant color of this flower. My friend Stefano is a builder in Italy. He built my house and we have two joint projects that he is currently working on. He has a group of guys who work for him. Most of these guys have been with him for a long time. They eat lunch together. They smoke together and take coffee breaks together. In the afternoon when they aren’t drinking coffee they’re drinking beer or wine. The kid in the picture is 18 years old. I have forgotten his name. He has been working with Stefano for a few years and I noticed on this trip how integral part of the crew he has become. He works really hard and seems to be trying to prove something. This young kid reminds me of how Stefano must have been as an 18 year. I did not hear him say “ci penso io”, but he sure was trying to do everything. When I was 18 I was finishing high school and getting ready to go to college. I had no desire for manual labor. I was interested in drinking, girls and not much else. I was pretty fortunate that I didn’t have to work a job to support myself. I did work as a bartender, but the work was nothing like what this young kid is up against. I also had these dreams and ideas about my future and what I was going to do, but in the end what I have learned over these last few years traveling to Italy is that I would love to build or restore an old, abandoned building in a medieval village. I would love to see the results of my hard work and I would also love to see the looks on the faces of the people who I built the house for. 20 years from now this kid will probably be doing exactly what Stefano does. He is in college now, but one that is quite a bit different than the school I attended. 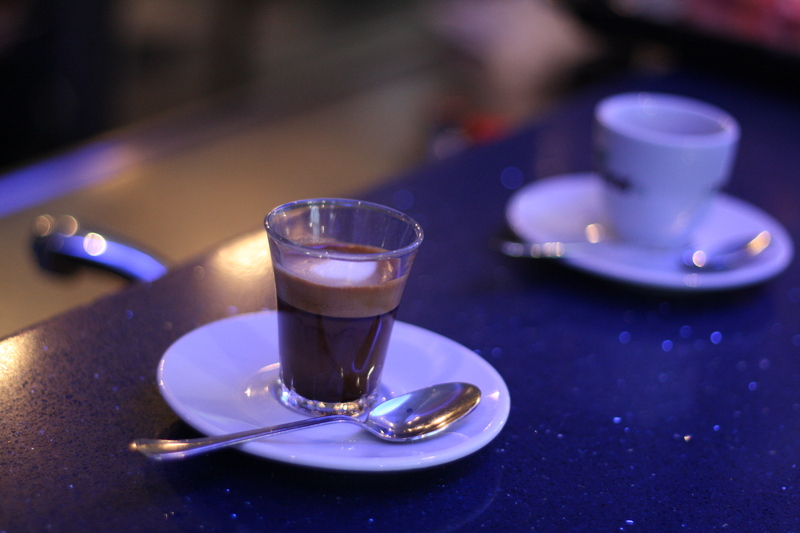 Here is the perfect caffe macchiato. You can only see just a little pit of the frothy milk on top. 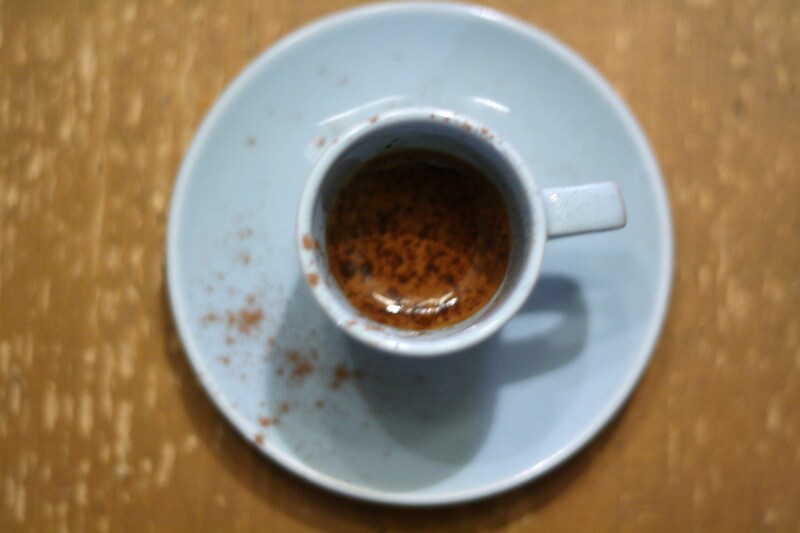 Take a look at the crema on top of the rich espresso. If you are not a coffee drinker after one of these you sure would be. Marino lives directly across from my apartment in Italy. I should say my old apartment because I just sold it to a family from Rome. That is the main reason for my trip this past week. I see Marino just about every day when I am in town. He has, as of lately started to use a cane and when I took this picture of him he was a little concerned about the cane being in the picture. I didn’t care about the cane. I just wanted to take a picture of his face. He had difficulty smiling, but after three attempts he finally smiled for the camera. Marino and his wife have a very simple life. They have lived in this village for many many years and like everyone in the village their lives follow a cetain pattern and ritual which does not veer off course very frequently. I am most grateful for the warm welcome I always receive from Marino and his wife. She always gives me the kiss on two cheeks and asks about my wife and kids. There is not much said amongst us but there is a warmth that I have found is very hard to find back home in Los Angeles. When I took this photograph Marino was sitting on a chair next to the entrance of the blue bar. He sits there quite often and watches the people come and go.